Update: A Vietnamese woman accused of assassinating the North Korean leader's half-brother was sentenced to three years and four months in jail after accepting a lesser charge on Monday and will likely be freed in May, her lawyer said. "In the first week of May, she will go home," lawyer Hisyam Teh Poh Teik told reporters in the Shah Alam High Court, outside Kuala Lumpur. Doan Thi Huong, originally charged with murder, had pleaded guilty to a lesser charge of causing injury, and the judge sentenced her to three years and four months in jail from her arrest in February, 2017. Hisyam said that with sentence reductions that are usually applied in the Malaysian system, she would be freed at the start of next month. A Vietnamese woman suspected of assassinating the North Korean leader's half-brother accepted a lesser charge Monday and looks set to be freed soon, after her Indonesian co-accused was released last month. Her lawyer says she is to be released in May. Doan Thi Huong smiled and said "I'm happy" after prosecutors presented her legal team with the new charge in a Malaysian court and they announced the details. She has been on trial since 2017 for the murder of Kim Jong Nam at Kuala Lumpur airport with a toxic nerve agent in a Cold War-style hit. It came after authorities last month rejected her initial request for her murder charge to be dropped entirely - a shock decision after the attorney-general agreed to withdraw the charge against her Indonesian co-defendant, Siti Aisyah, and she walked free. Salim Bashir, one of her lawyers, told reporters outside the High Court in Shah Alam, outside Kuala Lumpur, that the 30-year-old had been offered a charge of causing hurt by dangerous weapons instead of murder. Soon afterwards, the new charge was read in court to Huong and she pleaded guilty. The charge carries a maximum 10-year jail term but the lawyer said she would likely receive a shorter sentence. It is "very likely she could walk out free today", he said. Both women had always denied murder, saying they were tricked by North Korean spies into carrying out the assassination that shocked the world using a highly toxic nerve agent, and believed it was a prank for a reality TV show. Their lawyers presented them as scapegoats and said the real masterminds were four North Koreans accused alongside them, but who fled Malaysia shortly after the assassination. If released, it will mean that no one is facing murder charges for the killing in February, 2017 of Kim Jong Un's estranged relative, who was once considered heir apparent to the North Korean leadership until he fell out of favour. There were dramatic scenes in court when Huong's initial bid for immediate release was rejected - she sobbed in the dock and had to be helped out of court by two police officers. Vietnam reacted angrily to the decision, which came just days after the Indonesian defendant was released, and started stepping up pressure on Malaysia to free Huong. The stepmother of a Vietnamese woman accused of killing the half brother of North Korea's leader said Monday she was delighted her stepdaughter escaped the death sentence, urging her to "hang on" until her expected release in May. 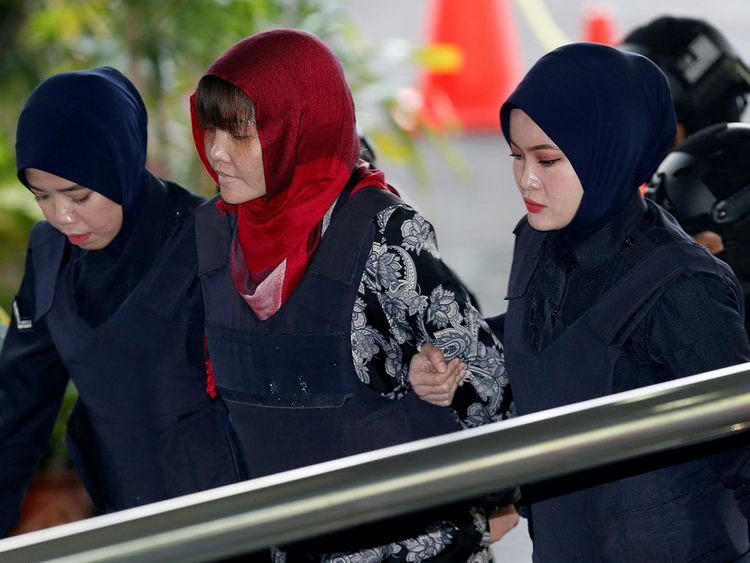 Doan Thi Huong dodged the death penalty on Monday after a Malaysian judge reduced her murder charge to causing injury by dangerous means over the killing of Kim Jong Nam with a nerve agent in 2017. Her lawyers had requested the charges against her be dropped altogether after her Indonesian co-accused Siti Aisyah was suddenly released last month, raising her family's hopes Huong might also come home. "We wanted her to be freed immediately," her stepmother Nguyen Thi Vy said in her rice farming village in northern Vietnam Monday. "The family is happy enough with her escaping death penalty," she added after lighting incense to thank ancestors for sparing her stepdaughter from death. Huong's new sentence is three years and four months in jail, which includes time served since her arrest in February 2017. Her lawyer said after sentence reductions she would most likely be released in early May. Vy urged Huong to stay strong until then. "To anyone meeting her, please tell her to try to hang on, just one more month," Vy said. Huong smiled broadly following her court appearance attended by her father. Vy broke out in a wide grin seeing smartphone photos of her smiling stepdaughter, whose mental state had deteriorated in detention, according to her lawyers. Huong underwent a psychiatric assessment last month after her initial bid to be released was rejected. Both women insisted they were tricked into participating in the brazen attack in a busy Kuala Lumpur airport on the premise that it was for a TV prank show. A former hair salon worker, 30-year-old Huong left home after high school to study pharmacology and accounting in Hanoi. With her funky hairstyles and cutting edge fashion, she raised eyebrows back in her conservative hometown in northern Nam Dinh province. Soon after the murder unverified clips of her on "Vietnam Idol" surfaced, while others showed her kissing a famous social media prankster on a popular YouTube channel. Her family echoed her pleas of innocence and said they are ready for her to come home. "I just want her to get married to someone who loves her, life will be easier with a husband and kids around for her," Vy said.